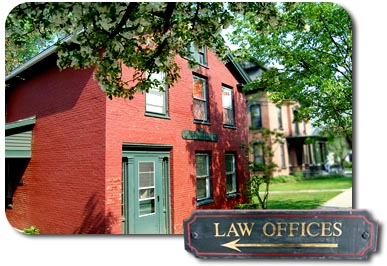 We specialize in Real Estate, Zoning, Land Use, Subdivision, Personal Injury, Estate Planning, Wills, Trusts, Guardianships and Probate Administration, and Commercial Law. Visit our Practice Areas page to learn more about our services, and read our Firm Overview for more information about us. We are located in the hill section of Burlington at 239 South Union Street, between Maple and Adams Street. Free parking is available. When visiting our office please park on the right side of the parking lot and enter through the parking lot level door. If you are unable to travel to our Burlington office, we will be happy to meet you at your home or office.